The disappearance of Atlantis into the dimensional limbo she called home for thousands of years shattered the True Atlantean Empire, but was not unknown to some True Atlanteans before the event happened. A few clans of True Atlanteans, the clans of Tarquises and Gilbatro had argued against the experiment saying the experiment would have massive repercussions on the entire Atlantean culture. They were correct. After Pandora’s Box was opened and the magic waned over the planet, the scientists of clans Tarquises and Gilbatro predicted a cataclysm happening to the continent of Atlantis which would scatter the clans and cause living conditions on the surface of Atlantis to become unbearable and impossible. In an attempt to prevent the greatest loss of life, the clans decided to explore the caverns underneath the continent to see if there was a way to create a livable area where the clans could go when the cataclysm they predicted occurred. While the clans were doing this they attempted to convince other clans of the coming danger and gain support and help for their expeditions. Few others believed their claims to be more than “doom-saying” and, especially after a few decades passed and no cataclysm struck, the Tarquises and Gilbatro clans were dismissed as nothing more than paranoid Atlanteans who were ignoring their obligations to protect the other inhabitants of the Earth from the monstrosities the True Atlanteans had unleashed. The Tarquises and Gilbatro clans decided to go ahead with their plans to construct habitable areas in these caverns without consulting the other clans, since the other clans have scoffed at their ideas of a great disaster which would befall Atlantis. to prepare them for the great cataclysm. clan artifacts which would not be abandoned to the cataclysm. who had decided to create a kingdom to better protect the humans of the Isle. form the warring tribes on the Isle of Britain. resurface, though very slowly. The True Atlanteans of Avalon decided to resend the team back to assist Uther in hopes of finding a way to use the magic to return Atlantis from it’s limbo. But, the team was told they would have to remain there until another pocket of magic could be found and they could be contacted again. The True Atlanteans from Avalon helped Uther build a nation until Uther became under the influence of a supernatural creature, Zazshan, who was portraying the wizard Merlin. Uther and the True Atlanteans did not see through Zazshan’s disguise soon enough and Zazshan had gotten a grip on Uther’s kingdom. Merlin was then able to arrange for Uther’s demise and began ruling the kingdom without the interference of a king. The True Atlanteans from Avalon were able to hide Uther’s son, Arthur, before Merlin could have him killed also. Merlin knew Arthur was still around but needed a way to bring him forth, so he created the test of Excalibur, which Arthur accidentally stumbled into. protected the boy from Merlin, using court politics to keep the boy alive. killing Arthur the first chance he got. plans and create a strong kingdom based on noble and good acts and laws. hoped this would lead to Arthur’s downfall. once again and reclaim his kingdom, lost to him so many years ago. enter the underground cities and prey on the True Atlanteans. cites and had amassed great armies to protect their new holding. continued to live underground, unknown to the surface world. Atlantis from the clutches of the Splugorth. being replaced by the clans of today; or so all believed. possess the other device and use it. of his clan who had found a way to survive the years and grow to great power. out in a war of brothers which lead to the death of over 99% of the Menengard clan. brought anger even to Milo, who had forgone war after the end of his families feud. they had to build war-machines. the weapons, to the Three Cities so that they could build and modify the weapons. in the art of magical combat. Milo saw this as a needed weapon in the upcoming fight. 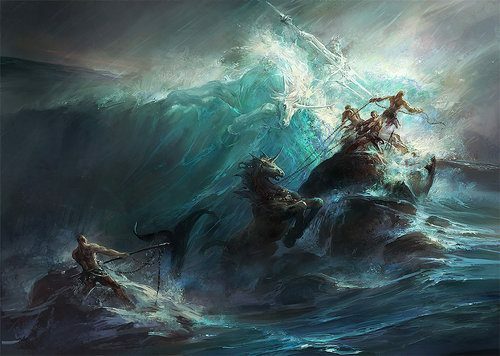 Atlanteans could not hope to retake Atlantis without an edge over the Splugorth. of an empire in another universe. in hopes of helping the human race cease their warring and come together in peace. Milo realized the Masters would never allow their technology to fall into the hands of another race and would track down the ship and eradicate any who stood in the way of their recovery of their energy source. Milo also knew the human race to have the best potential to take the technology and create a force powerful enough to repeal any invaders, and if Milo could get this technology it could be used to defeat the Splugorth. Milo took this plan to the clan elders and it was decided to send a detachment to True Atlanteans to infiltrate the human populace of the Earth and be there when the technology was created and also to help encourage the humans to build the weapons to fight the empire. Many True Atlanteans did not like the idea of encouraging the humans to create weapons, but Milo convinced them that the war was coming to this Earth and the True Atlanteans could either helped the humans fight off the Masters and their giants or let the humans fend for themselves. Milo’s arguments held and a contingent of one hundred thousand True Atlanteans journeyed to this alternate Earth and infiltrated the various countries to be their to receive and help when the spacecraft crashed. Milo himself journeyed to this world and infiltrated the Robotech Defense Forces working his way through forces, rising in rank to once again learn the art of war and familiarize himself with this technology. Over a few decades, the True Atlanteans stayed with the Robotech Forces and fought with them in their wars until Milo had risen to the rank of General, gained control of a fleet of over one hundred ships and a factory with the ability to build more of the ships and robotechnology. was once the Master’s Empire, Milo gathered the True Atlanteans back together under his commanded and had the ships under his command fold into space. The fold technology was known to be unreliable and could send ships anywhere was used by Milo to bring the ships to a secret location where the next stage of the conquest of Atlantis could take place. The True Atlanteans also gained an ally in the fight which tipped the scales greatly top their favor. While spying on the Kittani in Ki-Talon and studying their technology, the True Atlanteans were able to contact many important Kittani and were able to convince the Kittani of Ki-Talon to rebel against their masters in exchange for Ki-Talon given free state statis in the new Atlantean Empire. The True Atlanteans were able to convince the Kittani by showing them the benefits of being a free people; benefits which included the ability to study magic and even rune-magic if they wanted. The Kittani decided that though life under the Splugorth had been good, freedom would be better. Ki-Talon and the Kittani in her city joined the True Atlanteans in their attack on Atlantis. lead to the expulsion of the Splugorth from Atlantis. Splynn and the other cities, but many innocents died to free Atlantis. the Kingdom of Lagarto before the fall of Dragcona. the gargoyles, while the Metztlans were left to the veritech’s and the destroids. cities which were all, finally burned to the ground. Atlanteans who wished to migrate to the reclaimed Atlantis. technology that was built by the True Atlanteans underground. their own fight with the NGR than to think about helping the Splugorth. The Kingdom of Lagarto is now under the direct control of Styphathal who has decided to focus his attentions on South America and leave Atlantis to Splynncryth. Styphathal is actually happy to be out from under Splynncryth’s shadow. Manoa and the other True Atlanteans scattered throughout the megaverse, including in the Three Galaxies, have mixed feelings of the reclaiming of Atlantis. Some see it as a blessing and one of the greatest moves that the True Atlanteans could have done. Others feel it will only bring about ruin as the previous True Atlantean Empire did long ago. The Empire of the Sun believes this as a bad omen because the True Atlanteans brought about the downfall of the previous Incas Empire and might do the same now. The Coalition knows very little of the events which took place, though reconnaissance is coming back to them of the battles on the continent and reports of a large contingent of monsters appearing on the east coast of North America. This is worrying the Coalition and they plan to send troops out o investigate.